Downtown sunset shot from this year’s 4th of July fireworks viewing party (on the 3rd of July.) Won’t forget this roof top view anytime soon! Hellooo! 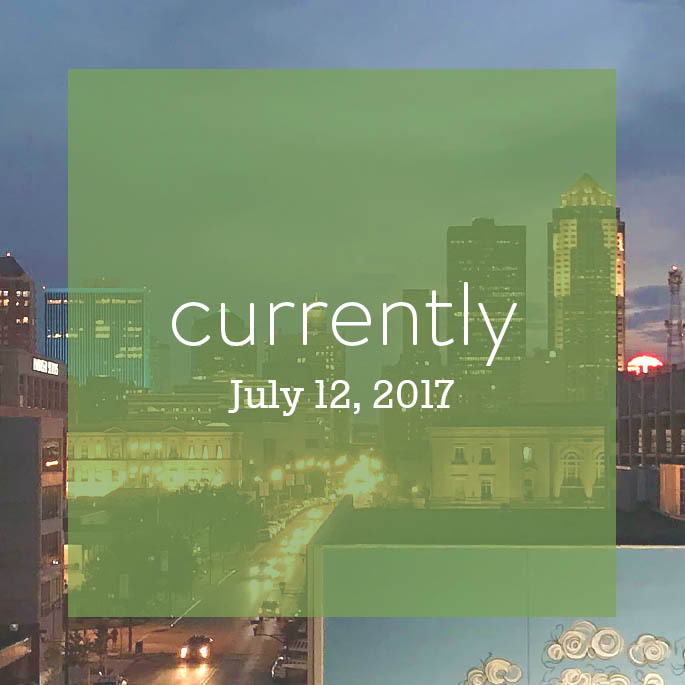 As I mentioned earlier this week, it’s been a hot minute since we last chatted about life…so, how’s life? :) Our summer is going well. Since Cameron still takes a morning nap, the boys and I don’t usually get out of the house until after lunch, only to turn around and come back for afternoon naps at 2pm. Last summer Lincoln and I were out and about almost all day, every day, so these slower paced mornings are different for us! That said, we’ve been enjoying our short yet sweet daily outings. 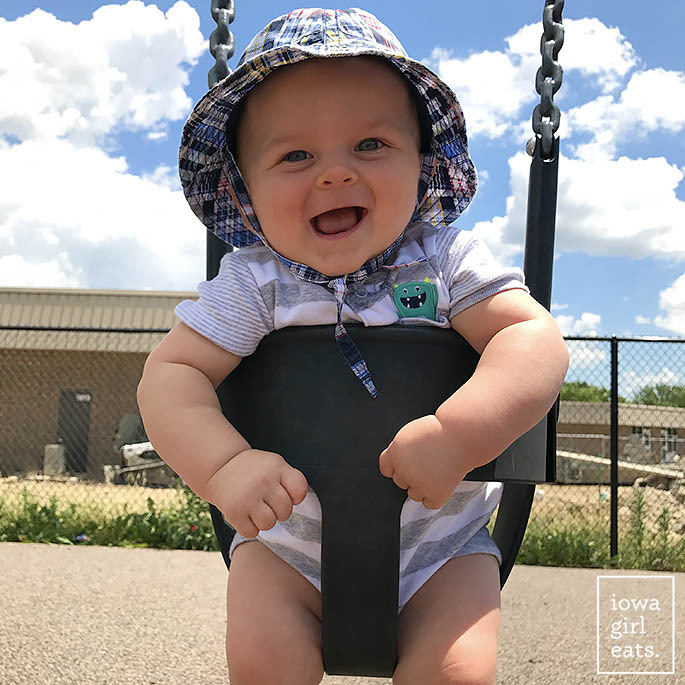 A certain smiley 8 month old hasn’t met a swing he hasn’t adored. And we’ve been making the rounds at the zoo, library, Science Center, and pool, too. Lincoln started swimming lessons last month and absolutely loved them. We actually signed him up for a second session because 4 day/week lessons for 2 weeks at the community pool are – wait for it – $40!!! You can’t do anything for $40 in this day and age – right?! 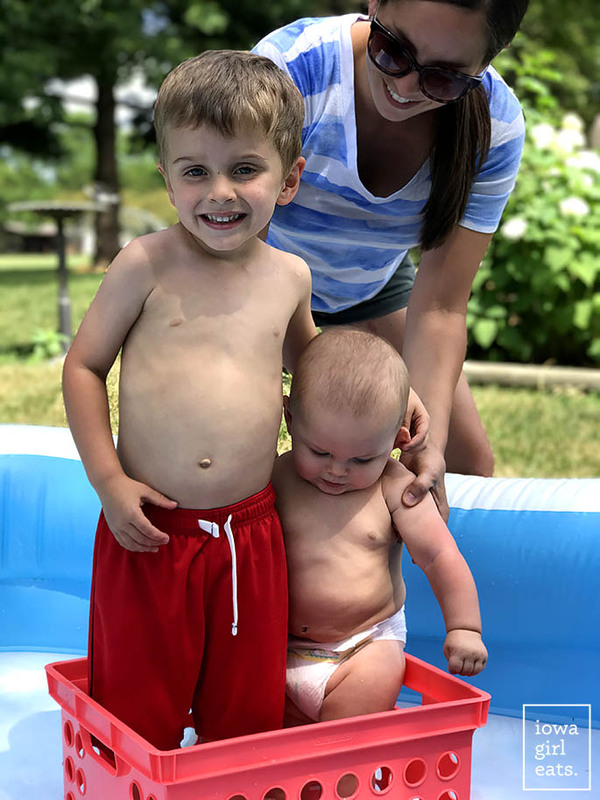 No lessons for Cam yet, though he’s been enjoying his “boat”, aka milk crate, in my parent’s blow up pool this summer. I seriously can’t even – bahahaha! Speaking of Cam, little man is on the verge of crawling. It’s going to happen either today or tomorrow then, pardon my French, we are TOTALLY SCREWED. He’s been barrel rolling to every corner of the house over the past few weeks and is already into everything, so there’s no telling what trouble he’ll get himself into once he’s fully mobile. Luckily big brother likes to keep a close eye on him (I mean, I do too!) These two are like peas and carrots though. Nobody gets as big of a slobbery kiss from Cameron as Lincoln does. Other than that, here’s what I’m currently into in between meals, naps, and diaper changes! Time and place: 12:33pm in my home office. The little boys are at the Science Center with our summer sitter and the house is quiet (too quiet if you ask me. I love hearing them laugh and play downstairs.) Alas, I finally have a few hours to GSD, so let’s do this! Filling: WeeSprout Reusable Food Pouches. 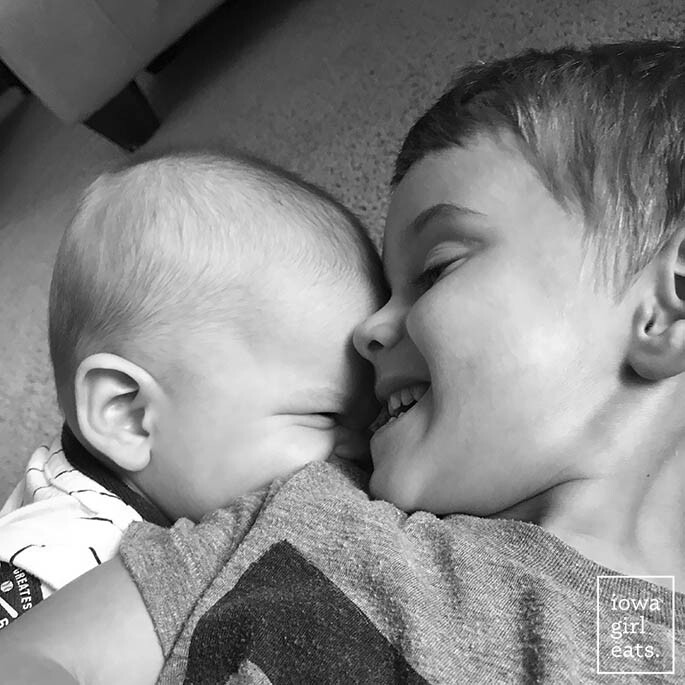 I was commiserating with a reader the other day about falling into the “pouch trap” with our babies. I can count on one hand the number of pouches Lincoln ate as a baby, but with two kids who eat three different meals a day, there’s no denying that grabbing a pouch from the cupboard is just sometimes easier! That said, I recently bought these WeeSprout Reusable Food Pouches on Amazon and they’ve been AWESOME. 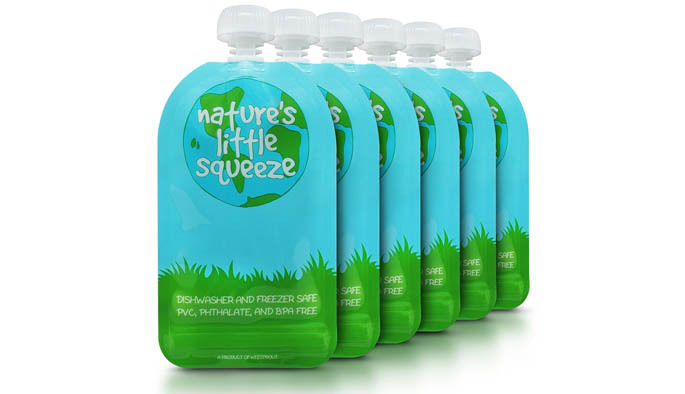 The pouches fill from the bottom so they’re easy to close, and more importantly clean. They’ve definitely helped me cut down on buying store-bought pouches. 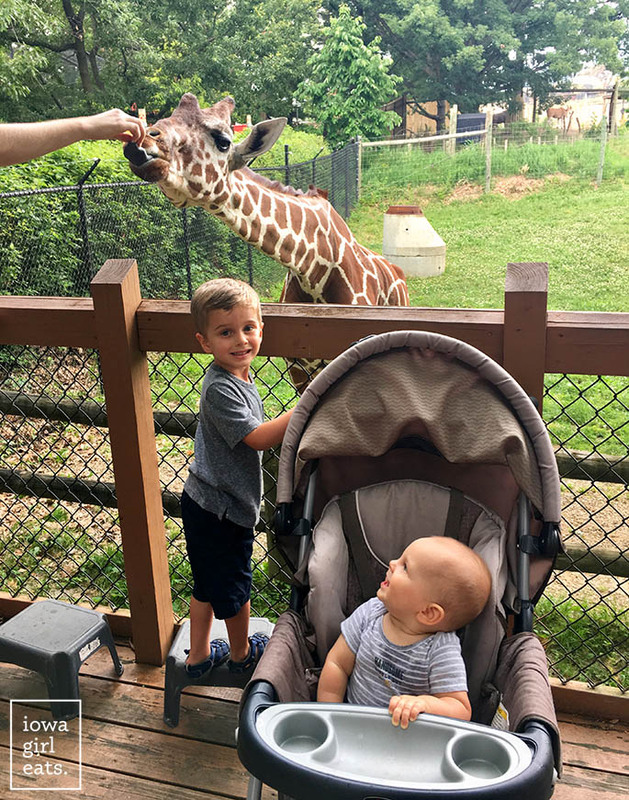 FYI: I’m going to write a post on both Lincoln and Cameron’s eating habits soon, so stay tuned! Loving: PopSocket. I recently pulled the trigger on an iPhone7 (that portrait lens tho) and was seriously fumbling with the gigantic size of the thing. 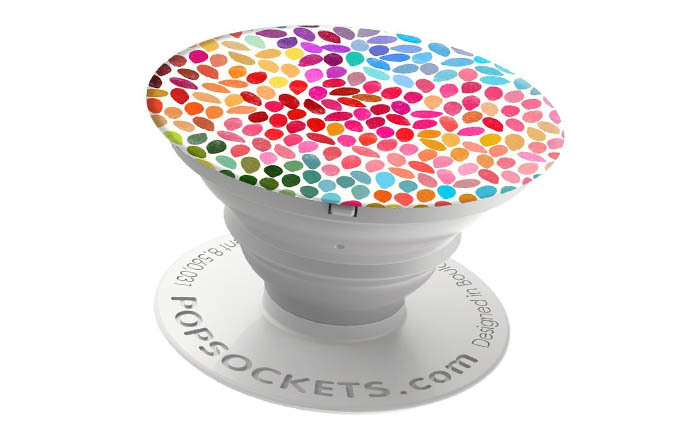 Then a friend who has even smaller hands than I do showed me the PopSocket she had on the back of her phone case and I ordered one on the spot (awkwardly, I might add, because the phone really is that big!) Anyway, these little poppers stick to the back of your phone and pull out/collapse to make it easier for small hands to use big phones. Super, super handy, plus they come in the cutest colors and patterns. Eating: Feel Good Foods Chicken Dumplings (Potstickers). 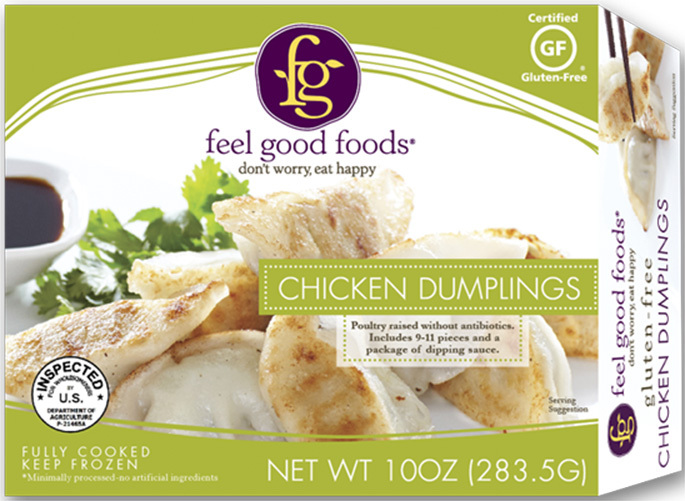 Ben bought these gluten-free potstickers on a whim a few months ago and we are HOOKED! They’re the closest in taste to the gyoza (ie potstickers) I ate almost every single day while living in Japan for a summer in college, plus they’re certified gluten-free. Not only are they so delicious, but I can recognize every single ingredient in the potstickers. How often does that happen with packaged, frozen foods? Never! I buy these at Hy-Vee, by the way. Watching: Master of None. Everyone’s talking about the new seasons of House of Cards and Orange is the New Black, understandably because they are legit, but I’ve got another show to add to your Netflix queue – Master of None. The show is kiiind of like Seinfeld for millennials, and so far I’m liking the just released 2nd season even better than the first. Definitely give it a shot. Making: Coconut Flour Peanut Butter Muffins. 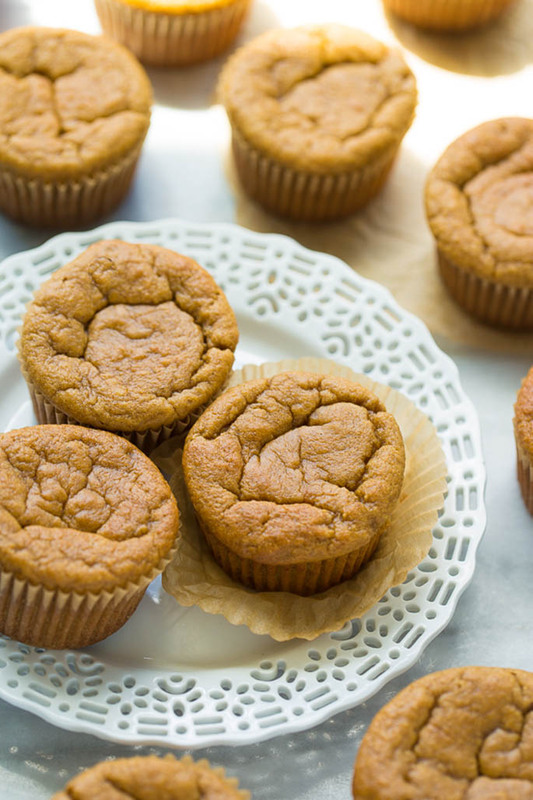 Lincoln and I whipped up these Coconut Flour Peanut Butter Muffins a couple weeks ago and they were a huge hit with both of us, plus Cameron too! The batter is blended in the food processor so there’s only one bowl to clean (I’m sure a blender would work too,) plus they’re naturally sweetened with bananas and maple syrup. 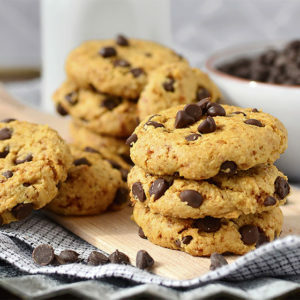 They were so nice to have on hand for quick and easy, feel-good snacks. Laughing: Trey Kennedy. Oh my gosh, have you discovered Trey Kennedy yet?! If not, YOU’RE WELCOME. This guy is so, so funny – I check his Facebook and Instagram accounts for new videos several times a day, and his “helping parents with technology” video is my current favorite. Mostly because Ben has to teach my parents how to use their own remote every time we go to their house, and I’m pretty sure this is what’s running through his mind! 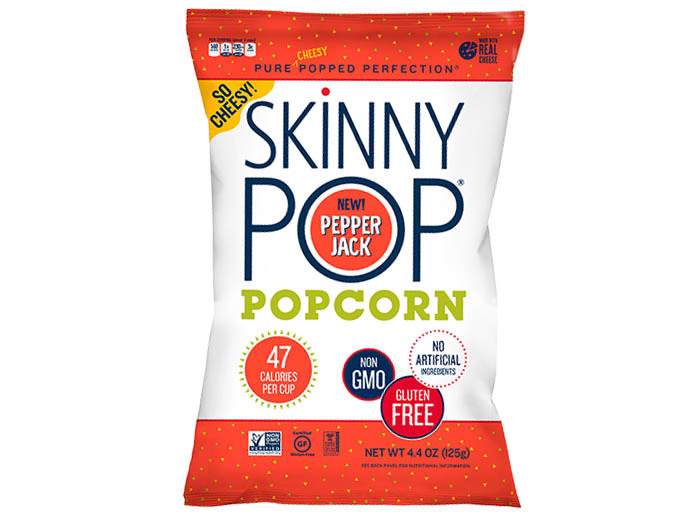 Snacking: Skinny Pop Pepper Jack Popcorn. 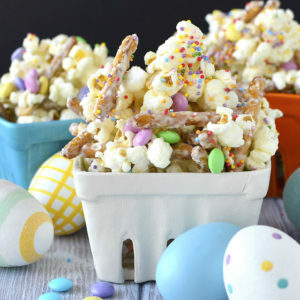 Skinny Pop popcorn is a staple at our house but we usually stick to the plain kind because it’s so tasty. However, my hand involuntarily snatched this Pepper Jack flavor off the shelf when I passed by it at the grocery store last week, then my jaws inexplicably ate the entire bag in less than 24 hours. Read: TRY THIS. Ordering: PF Chang’s Pad Thai. Ben and I support local restaurants by giving them our business over chain restaurants whenever possible, but hot dang does PF Chang’s have a good gluten-free menu! 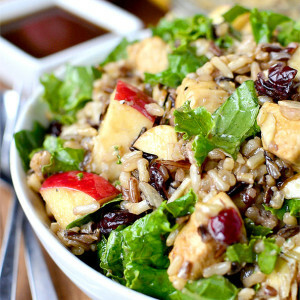 Ordering through their website is super easy and we usually do so 3-4 times a month. Right now I’m stuck on their Pad Thai which doesn’t taste extremely authentic or anything but it’s super delicious in it’s own right. 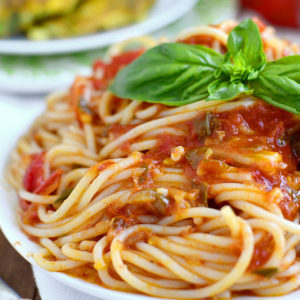 Now I’m craving it for dinner! 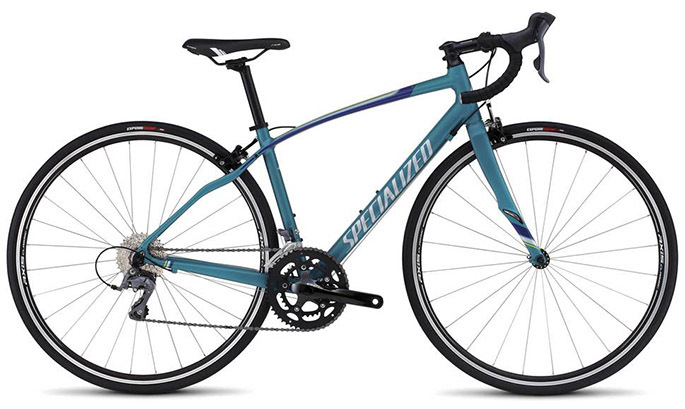 Riding: Specialized Road Bike. After talking about it for the past couple of years, I finally bought a new bike! It’s so true what they say about working out not feeling like a chore when you’re doing something you enjoy, and I truly enjoy biking. I’ve been taking a twilight ride almost every night since we bought this baby (different paint job then the one pictured below) and it’s just been FUN. I come home exhausted, sweaty and sore, but super happy. Next stop – double burley (looking at the Burley Bee – any thoughts?) We’ll wait until next summer as Cam’s still too young for us to feel comfortable pulling him. Locals: I got my Chloe Specialized bike on mega sale at Rasmussen’s. Highly recommend them for their service. 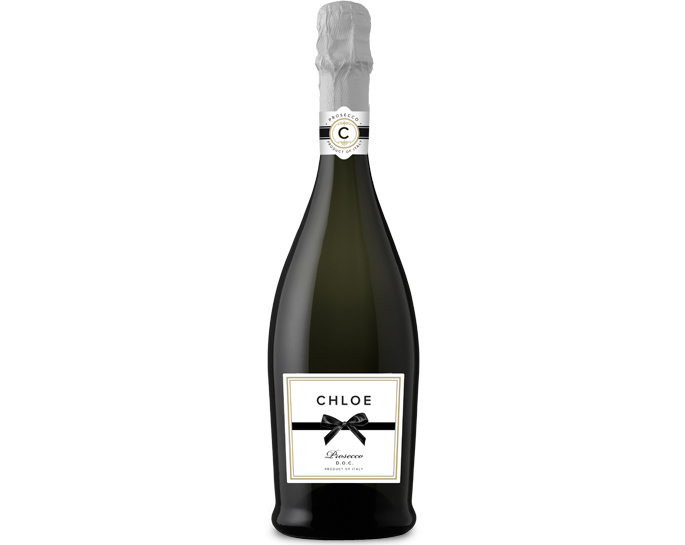 Popping: Chloe Prosecco. I saw a piece about Christie Brinkley’s new prosecco line on CBS’ Sunday Morning last week (#faveshow) which reminded me that I need to tell you about the prosecco I tried last weekend at a friend’s house. Chloe Prosecco is under $14 and sooo, so good. 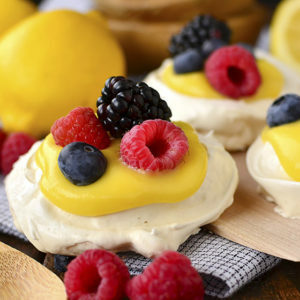 Not too dry, nor too sweet – just perfect. Can’t wait to pop another bottle. Locals: it’s available at HyVee. Many say it has no taste but when I stirred a scoop into a glass of water there was a hint of funkiness. Now I stir it into my hot coffee in the morning and it’s undetectable. Super easy to add to smoothies, applesauce, yogurt, etc too, as it dissolves in cold or hot liquids. Pick a “currently” category and fill me in on what’s going on with you! Let me know what you think after you use it for awhile! I sing those Wee Sprout pouches as well! 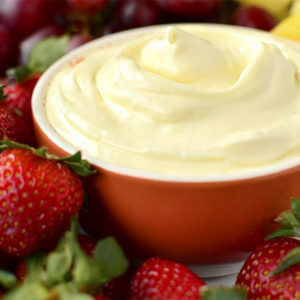 I mix full fat yogurt with unsweetened applesauce and that is their breakfast every single morning. They hold up so well too! 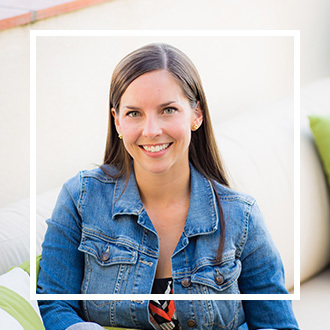 I’m a huge fan of collagen as well and have notices huge changes in my hair and nails. Only downside is my toenails grow super fast now!! Pedis only last a week and a half before I need to file those suckers down. I love these kinds of posts…I can’t wait to try those PB muffins! Hahaha, yes, that is so true!! I am constantly trimming 20 nails now! Thank you for telling me how to use my container of collagen I’ve had for a few months now! I’ll add it to tomorrow’s coffee. Also, I love Specialized bikes. I bought one in February, tossed a baby seat on the back for our 2 year old, and absolutely love it! Eek – can’t wait to get the boys out on the trail with me! Thank you for that tank recommendation from Gap! I just ordered it. For anyone else interested, they’re having a 40% off EVERYTHING sale right now – code “midsummer”. I also am on the collagen train – I put it in my smoothies every morning, and I swear I can tell a difference too. My skin is so glowy. Yes, to Master of None! I enjoyed the first season but the second season was just amazing. It’s funny, of course, but I found many of the episodes moving, especially those addressing family relationships. And I love how each episode is like a mini-movie, with nods to film classics. It’s a must-see for sure! 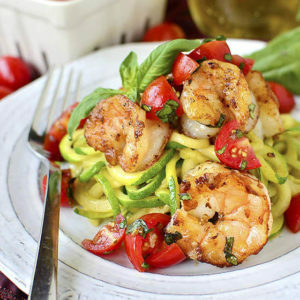 That pad Thai just gave me the biggest craving for Cool Basil’s pad Thai. 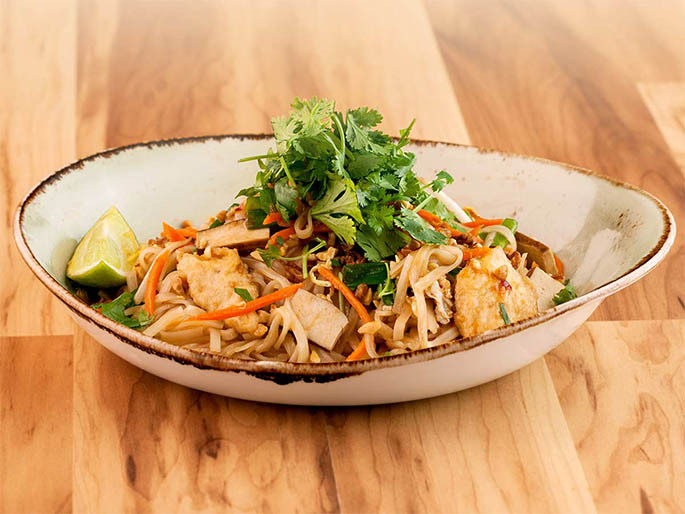 Oh my gosh seriously – they have the BEST Pad Thai…drool. Ahhh, collagen peptides….I bought it a month ago and couldn’t get past the taste when mixed in water or juice. Definitely funky tasting! But I just threw some into my coffeee tumbler before I headed out the door, and while I can still taste it a little….it’s definitely a huge improvement!! Thanks for the suggestion! I was worried I was going to waste the entire (pricey) tub. Hot coffee is the way to go, thanks for the suggestion! You bet!! Glad the tub won’t have to go to waste! I am obsessed with re-fillable pouches! I love making my little one different combos but it is also easy to buy the giant $3 applesauce jar and fill several pouches! I feel less bad about just handing her one of those! For sure – they are so great! 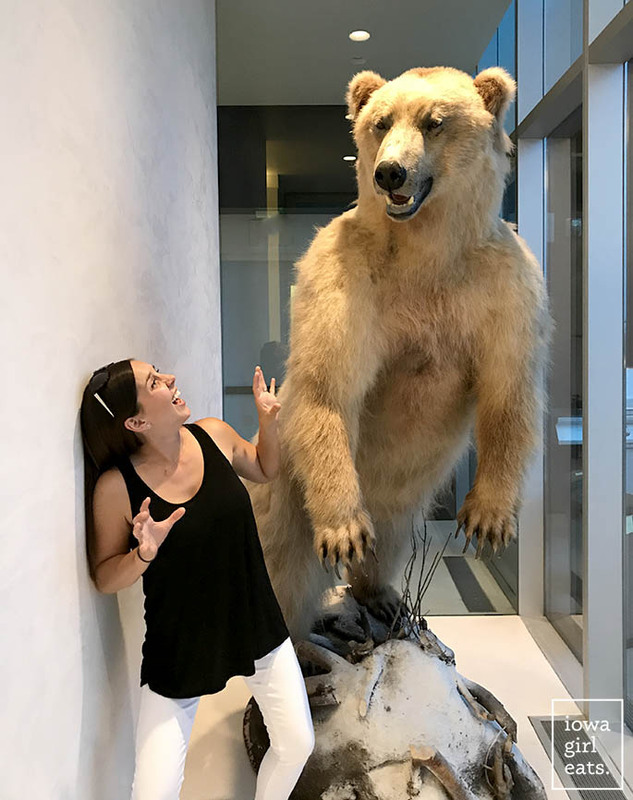 Haha I have also met that polar bear. Quite frightening! But it is such a cool view from the rooftop! 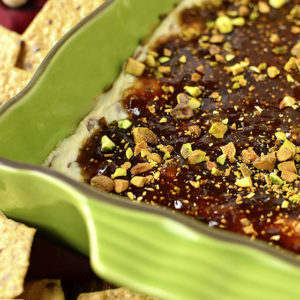 Snacking – Bliss Bites from A Couple Cooks. I swapped tahini for the PB in the recipe, because I don’t like the combo of PB and chocolate. (Also, tahini is supposed to help with breast milk production? Jury’s still out on that one….) They are sososososo good! Also, sorry for the personal question, but do you find that Gap tank to be nursing-friendly? My little peanut (4 months) is a snackaholic, so I have to be ready to nurse wherever, whenever, and I feel like I’m constantly wearing the same 2-3 nursing tops. My wardrobe could use an update! 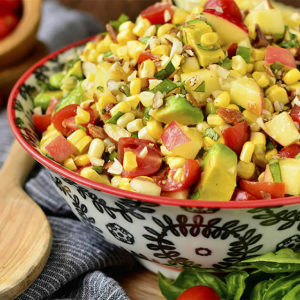 Ooo those sound awesome – I’m always looking for new, make ahead snack ideas! The top is low enough to pull down for breastfeeding! I totally caved on the pouches with my second kiddo too. He’s turned out to be a picky eater though (my oldest will eat ANYTHING) and I kind of wonder if the pouches had anything to do with it. What can you do though? The fact that you can rock white jeans with two little boys is a miracle! Any time I wear something white it’s like a magnet for every staining food. Haha. Glad to hear you are having a fun summer Kristin! 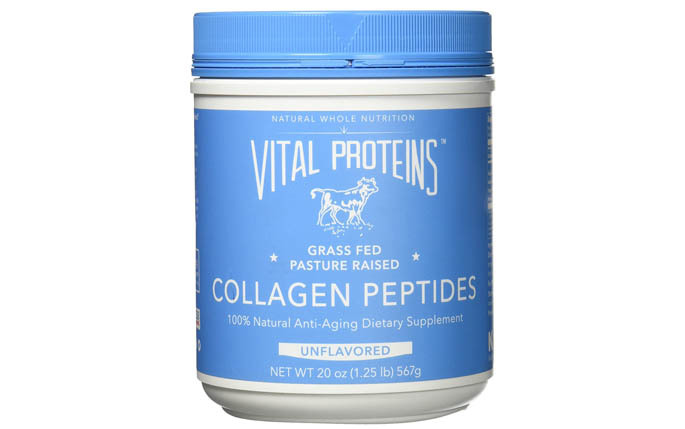 I just purchased Collagen Peptides yesterday during Prime Day to give them a try!! I am excited. We’ve watched Master of None season 1, but haven’t started season 2 yet…guess we will have to give it a go. We are plowing through Shameless and the new season of House of Cards right now. This last season of HOC was sooo good – I was so depressed when we finished! Yahh! Let me know what you think after you start using it! Master of None — LOVE!! I changed my phone to the same sounds that Dev has. It cracks up my husband & I when I have the sound on & I get a text. Pepper Jack popcorn – kill me now! That sounds awesome. Going to look at Gap now. I loooooove Master of None. One of my top 3 favorite shows “on” right now. Aziz is from South Carolina like me so I’ve always loved him. Season 2 was definitely amazing – that scene in the cab (with no words) was so riveting. Another young one who loves CBS’ Sunday Morning! It’s appointment viewing for our entire family. The preschooler dances to the opening theme, the adults watch the stories and then the dog barks at the nature segment at the end. Hahaha, I have the cutest visual in my mind right now. :) The weekend doesn’t feel complete without watching it! 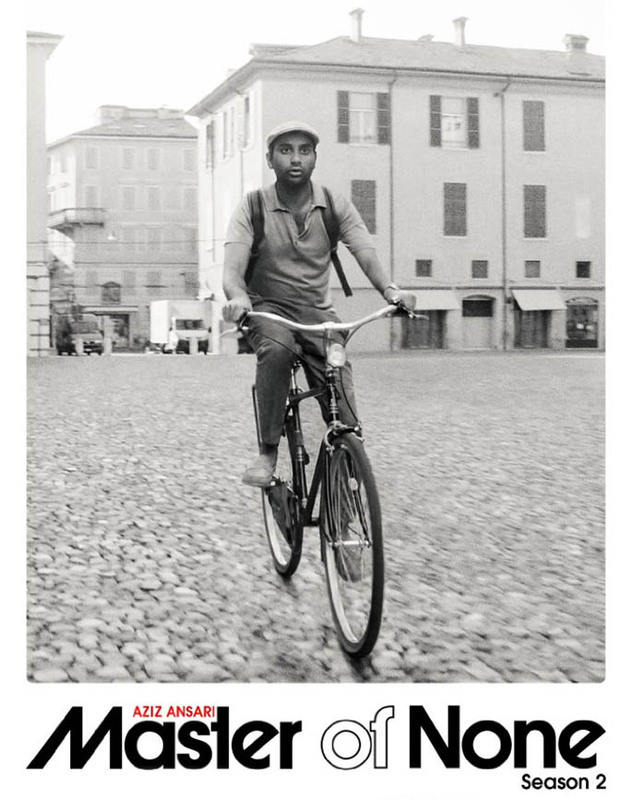 Also – Masters of None! The second season is sooooo good! Would you mind sharing how much of the Collagen Peptides you take each day? The instructions say to use 1-2 scoops a day. Wondering how much is really needed to get results. Thanks! You bet! I use a heaping scoop in my coffee, and 2 if I’m adding it to a smoothie. Life-Changing is my review of my pop-socket. Seriously, i love it so much! Glad you’re enjoying yours as well. Also, your kids are absolutely adorable! I love how close they are. My brother and I were very close growing up, and we’re still best friends today! LOVE Master of None! I liked Season 2 even better than Season 1. 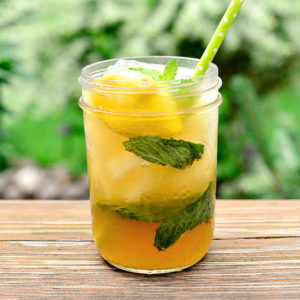 I found actually found that the Vital proteins dissolve the best in hot liquid! Glad there are more people jumping on the bandwagon as I thought I was too late! I also received a sample of the marine collagen this past weekend so I am excited to see if they differ at all! Let me know what you think of the marine collagen after using for awhile! love the view from the roof top, where was this at in downtown? It was in the East Village at the workplace of a friend’s dad! I enjoy you SO much. I’m a Midwest girl and our daughter was diagnosed with Celiac last fall. Now I’m trying the GF life to see if it helps with my psoriasis. The first thing I made was the GF chicken & noodles. 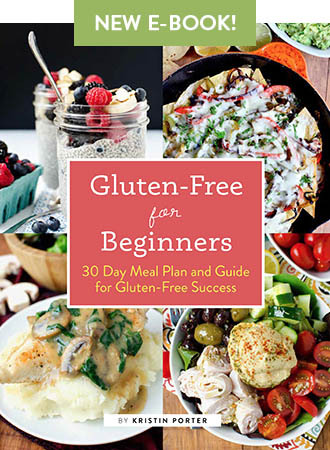 Thank you, thank you, thank you, for sharing all your GF knowledge with us newbies. Off topic, but please bear with me! I offered to bring an egg dish to a birthday brunch because I had a super easy recipe that I can’t find! I thought it was one of yours. It is not particularly healthy, but yummy and GF. You start with 4 cups of shredded cheese on the bottom and then mix eggs 8-10??? With some 1/2 and 1/2 Or cream and pour on top. I know I am missing the “details”, but does it sound like one of yours? 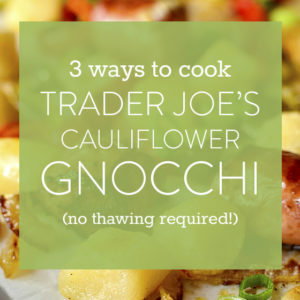 This sounds totally yummy, but I don’t think it’s mine – I’m so sorry! 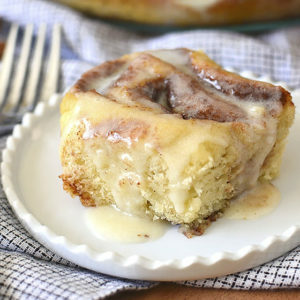 Do you need another breakfast idea to take? That would be great, but has to be quick with few ingredients as the Brunch is at my house and I will have a 3 and 5 year old while I am preparing! Eekkk! Hey I just wanted to say I tried Popsockets on your recommendation and they really do work – I love them – could you do another currently soon? I love those along with all the great receipes.